The last time I felt comfortable holding a gun was in 1950 when I was 8 or 9 and the gun in hand was a Gene Autrey cap pistol. After that I had an ambiguous relationship with guns. I felt a repulsion to them and an attraction. In the early 50s I asked for and got a Daisy pump action bb gun. With it I shot the windows of nearby warehouses. I thought this was fun. In my boarding high school I purchased a CO2 bb pistol and shot cans with it in a nearby field. When Brother Stanley Repucci, CSC, asked me if I wanted to join the St. Edward’s High School Gun Club and to become an honorary member of the NRA I turned him down. I told him I was scared of guns. In my two years as an Argentine Navy conscript I easily passed the shooting range instruction. I was very good with a turn of the century (the 19th) Mouser, a vintage American burp gun and an Argentine issue version of the .45 Colt Automatic. It was in the early 70s in Mexico when I was again re-acquainted with guns. In my Palmolive English class I had a student, a blonde Mexican called Mr. Conn. He was low key, spoke pretty good English, softly and took a liking to me. He asked me if I would want to go to the shooting range with him. I was curious. He had a Colt .45 (if I remember well) and an Olympic style .22 calibre one-shot target pistol. 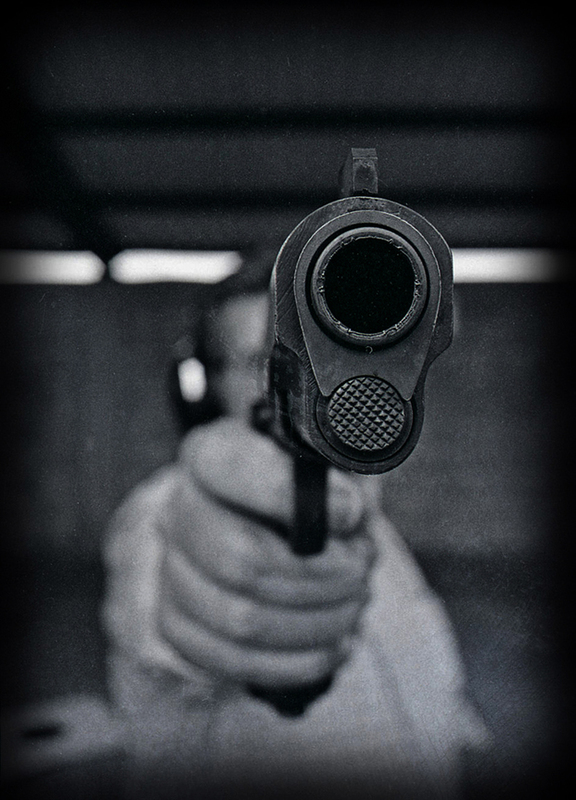 I found that shooting his Colt was sort of like watching Peckinpah’s Straw Dogs on a Friday night after a terrible week of work and bumper-to –bumper driving in congested Mexico City. I felt a relaxing release. I almost enjoyed it. But I took a photograph of Conn with his automatic that I think that gun people would find verboten. Five years ago I shot my friend’s wife’s automatic in Texas. I can remember mostly how loud it felt. And my shooting after all those years in Buenos Aires was still good. I have told many people who ask me about my stance on guns that I am a person with a terrible temper and having one in the home could be dangerous to others. I remember that back in the early 70s a boy about 9 in my Rosemary’s elementary school class (it was a private school that catered to wealthy Americans living in Mexico City) shot and killed a friend accidentally when he removed a gun from his father’s closet. His father was a CIA operative in the US Embassy. As if everything was normal the boy returned a couple of day after and told my Rosemary that she should treat him with kid’s gloves as he had killed a friend. The only thing left that is appealing to me about guns is the smell of metal. My old 35mm cameras have a similar smell (but no traces of gunpowder). Few people ever think that metals have smell. Guns with their gunpowder traces and the special grease used to keep them functional have a smell that after all these years is sharp in my memory.